My plant has been growing in my northern Sydney garden, in clay soils for over 10 years. As a street tree, it is very healthy and flowers each year in August to early September, even though the soil and water conditions here are far from ideal for this plant. It is approximately 6 metres tall by about 5 metres wide with slightly pendant branches forming a bushy crown. It has profuse small yellow, scented ball-shaped flowers followed by pod-like fruit. In winter 2012, it flowered at its best for a long time probably due to the good rainfall Sydney received over that year. I am also growing a few of the dwarf form of Acacia fimbriata. This is a compact shrub growing to 2.5 metres tall by 1.6 metres wide with a slight weeping habit. The attractive green foliage and new growth of this plant lets me use it as a feature plant – for great landscaping effect. I prune one of my dwarf plants heavily each year i.e. to within 30cms of the ground to make it more compact, and this seems to have no ill effects. Acacia fimbriata and the dwarf form of this plant are fast growing, nitrogen-fixing, frost hardy (will tolerate frosts to -7 C) plants which are suitable for hedging or screening. King Parrots and Crimson Rosellas love eating the seeds and the pollen is utilised by bees. They also require little water once established. I have found both plants to be long lived and can recommend growing them for their foliage and perfume when flowering. 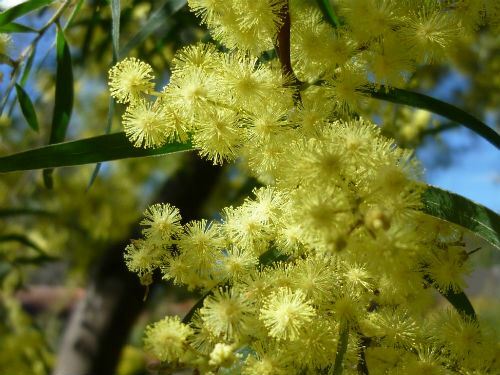 Another reason for growing this plant is to have them flowering on September 1, which is the official Wattle Day, something we all should be celebrating (well I think so) as it has a long and proud history. Acacia – comes from the Greek acis, a thorn, a reference to the thorny stems of the type species. Fimbriata refers to the fringe of hairs near the base of the 'leaves' (phyllodes).